(January 2016) -- Sisters Margaret Mary McBride, Madonna Marie Bolton and Rachel Torres renewed their annual vows of poverty, chastity, obedience and service during a special prayer service honoring the Sisters of Mercy on Foundation Day hosted at St. Joseph’s Marian Chapel in early December. The ceremony also commemorated Pope Francis’ launch of the Year of Mercy.The sisters follow in the footsteps of their foundress, Catherine McAuley, who established the religious order in Ireland on Dec. 12, 1831, to serve the sick, poor and uneducated. In 1892, the Sisters of Mercy traveled to Phoenix to open a parish school—a mission that was quickly expanded after it was discovered the community was under siege by tuberculosis. Once the school was fully functioning, the sisters raised enough money to begin operating the Valley’s first hospital: St. Joseph’s Sanitarium. Over the last 120 years, St. Joseph’s has evolved from a 24-bed facility for patients suffering with tuberculosis into a 607-bed world-class hospital that treats thousands of patients annually. While the location has changed, and the building has expanded multiple times, St. Joseph’s Hospital still relies on the support of the community to fulfill its healing mission. St. Joseph’s Foundation continues the Sisters of Mercy’s legacy, raising money to further the healing ministry of Jesus, providing high-quality, compassionate healthcare services to all patients served at Dignity Health St. Joseph’s Hospital and Medical Center. Your gift to support the Mercy Heritage Program will ensure the legacy of the Sisters of Mercy will last long into the future. Although many of the Sisters are facing retirement, and few are following in their footsteps, donations supporting this program will be used to train select employees to carry on the mission in the hospital and throughout our community. Please show your appreciation of the Sisterhood through generous giving! 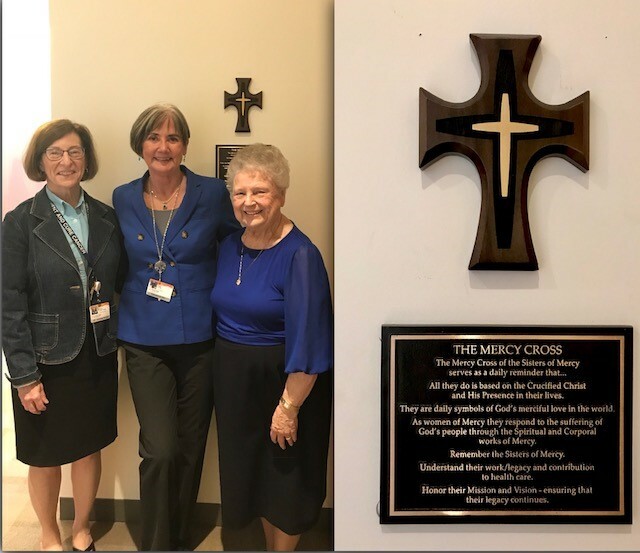 UA Cancer Center VP Marcia Gruber-Page (left) joined St. Joseph’s Hospital President Patty White (center) to participate in a Dedication Ceremony led by Sister Madonna Marie Bolton (right), recognizing the addition of a Mercy Cross and plaque to our cancer center. The items were installed in the Mercy Meditation Room at the UA Cancer Center at St. Joseph’s—where they will serve as a daily reminder of our rich history and mission.